HAIL!! HAIL!! ROCK!! AND ROLL!!! Like many others, I love his music. I am who I am because of the influence of his music. 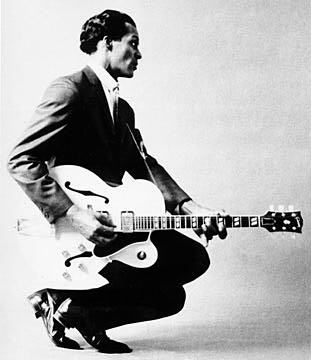 Chuck Berry owes me nothing, I owe him a debt impossible to repay. It’s funny how genres work. There’s many theories on how they come to be and how they evolve. Call me cynical, but in this century at least I think it’s all rooted in revenue for record labels. The astute readers will have heard by now that “Rock and Roll” became a buzzword when somebody white- they say it was Alan Freed- started promoting Rhythm and Blues records under a new moniker in order to keep white parents from freaking out. And then, with this new name, record companies could promote others who fall into the new category. Like Elvis? How about Gene Vincent? Like Buddy Holly? How about Jerry Lee Lewis? Buy them all. Now, these are four very different artists. You would be doing yourself a great disservice if you decided you didn’t like “Rock and Roll” by dismissing all of these because you didn’t like one of them. This is true for all genres. It’s a shell game. I surmise that no man is more aware of this than Chuck Berry. Keith Richards here makes the arrogant assumption that Chuck is unaware of his talent and impact. I think the truth is that Chuck doesn’t give a damn. When the famously sour Keith gets saccharine about how the lasting eternal influence of Rock and Roll must be preserved Chuck looks at him like he’s speaking Yiddish. See, there often comes a point for someone driven to perform for an audience at which the desire to attract attention to themselves or secure some legacy means less than anything. Is this such a bad thing? Or is it healthy?